Central Idea: We are living in the year acceptable to the Lord. Lectionary: 69. To view the Lectionary readings, click here. Jesus’ entire proclamation, including his reading of the prophet Isaiah to his fellow townsmen in Nazareth and declaration that this glad prophecy is now fulfilled. Our own experience of hearing our Law, the Gospel, read and our saying yes to it when we recite the Creed, when we sing the great “Amen” at the end of the Eucharistic Prayer, and when we receive Holy Communion. This Old Testament reading gives us a context to understand what our Lord means in the Gospel about his public life being an acceptable year of the Lord. The layman Nehemiah and the priest-scribe Ezra rebuilt the destroyed city of Jerusalem and the Temple of God. Ezra found a copy of the Books of Moses and read it to the re-gathered remnant of the Chosen People. They wept out of joyful contrition, but Ezra tells them not to be sad but to feast on rich foods and sweet drinks, rich and poor alike. God’s message underneath is always life-giving goodness, truth, beauty, and love. This is especially true when God comes close to us. He has done this above all in the person of God the Son, Jesus Christ, in his Incarnation, and in how he is always with us in so many ways, especially by means of his Church. Spirit means breath, as in the very air we breathe in and out, without which we could not live more than a few minutes. Spirit means the immortal, rational soul which is the principle of our bodily lives. Spirit also means the Holy Spirit who renews us, making us children of God and heirs of eternal life—not just life now but life forever. The Holy Spirit also makes the diversity of believers into the one body of Christ. The Holy Spirit creates the “assembly” of God, the Church. Recall the assembly of Israel under Ezra and under Moses. The word for “assembly” in Hebrew is the origin of our word for church. St. Paul teaches us that through the Holy Spirit the Church is the one body of Christ made up of many individual members. Christ and his Church are united like a human person is a united body and a soul. Though the various parts of the body are different, they are all necessary for a person to live. There is no real distinction of persons in this one body. Everyone can be an equal member: Jews and Gentiles, slaves and the free, rich and poor, men and women. 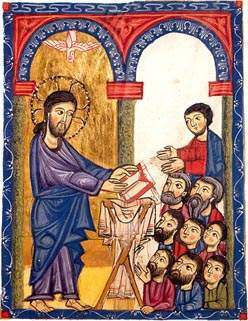 St. Luke explains the origin of his Gospel. He decided to “investigate . . . accurately anew” all the “events that have been fulfilled among us” according to how the “eyewitnesses from the beginning and ministers of the word have handed them down to us.” Then he wrote a narrative of those events “in an orderly sequence.” He wrote it for “Theophilus,” that is, the lover of God, so that he would “realize the certainty of the teachings” he has received. By events, Luke is talking about the life of Christ and the birth of the Church. By eyewitnesses, Luke is talking about the Blessed Virgin Mary and the Apostles and the rest of the original disciples, those witnesses from the beginning. We have received the same deposit of faith. Luke wrote these things down for our benefit, so we can be confident that what we are being told is certainly true. Luke wrote about “events that have been fulfilled.” That is, they had a very important meaning. They were good news that accomplished what they announced. Christ announced salvation with his words, he showed salvation in his miraculous acts or signs, and he accomplished our salvation through his Paschal mystery. The Gospel reading then moves on to one of the most dramatic moments of Christ’s public life. For his own townspeople, he read from the book of Isaiah about the dawn of the messianic age and the coming of the messiah and said, “Today this Scripture passage is fulfilled in your hearing.” In other words he was saying, “I am the one Isaiah promised you.” He proved he was this man by his marvelous preaching accompanied by miracles. “A year acceptable to the Lord” began, because God was visiting his people, pouring out his blessings on them: Good news to the poor, liberty to captives, sight to the blind, freedom from oppression, and much more. This year is still going on. We live in an era or age of history acceptable to the Lord. Everyone can now come to God and find redemption, if he or she wants. It is up to us to help those around us. The day that Ezra read the Law to the re-gathered remnant of Israel was a holy day. The time during which Christ preached in Israel was an acceptable year. And ever since the Resurrection of Christ, we have been living in an acceptable, joyful epoch of history. The Redemption is a joyful message—our sins can be forgiven, we can live as children of God, we can have eternal life. The reality of living this way is also joyful. The early Christians won over the tired, immoral, and hopeless Roman world through their charity, chastity, and cheerfulness. So have all the saints ever since. Today in this Year of Faith, we have to understand and experience the goodness in these good words of the Gospel. People alive today urgently need to be evangelized, that is, to have the Catholic Faith presented to them in an authentic and attractive way. Lucky for us, the Faith is already attractive in its goodness, truth and beauty, which is why it is called gospel or good news or glad tidings. The people today needing evangelization includes us, our families and friends, those who were once Catholic but are not any longer, our separated brethren in other Christian denominations, non-Christians, those who are downright hostile to the Faith, and those who have never heard of Christ. What can we do? Do one thing each day, however small it seems. Pray for light. Ask our Lord often, daily, What can I do? Pray for others to embrace the faith or return to it. Don’t forget to pray for their temporal needs, too. Start getting to know people. Make friends and acquaintances instead of just minding your own business all the time. Talk to people so that you to get to know them and they get to know you. Perform a spiritual or corporal work of mercy with an apostolic motive. Our brothers and sisters in the Faith have always been deeply concerned with those who are in need. In this they and we are just following our Founder and Head, who went about doing good while he walked the face of the earth. Offer your work and whatever sufferings you have to endure this day for the spread of the Faith.